Last year, when I drove down to Shawnee, Oklahoma for the EDP class, I did the drive as one long marathon haul. I blew out of Indy in the pre-dawn darkness, with the sun coming up about Terre Haute, and rolled into the Holiday Inn Express parking lot with a bit of glow left on the western horizon. That was only 740 miles, and the run to New Orleans for Tac-Con this year (well, actually Westwego, just on the far side of NOLA) was another hundred miles further than that. 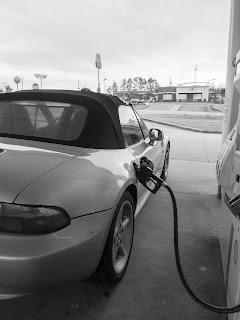 I decided that I was about shut of ten-plus hour days on the interstate in a convertible whose top was so drafty you couldn't hear yourself think. Instead, I booked a room for the night in Cullman, Alabama on the way down, and again on the way back. I have to say that that is the way to roadtrip if you're not under crushing time pressure. A five or six hour drive allows one to get a leisurely start in the morning, check out of the hotel after rush hour is over, and still arrive at your destination before evening rush hour has started. Plus I'm accumulating points I can burn at my next inevitable stay at the Holiday Inn Express in Alliance, OH.